As requested by readers on the Crocheted Cotton Washcloth Sampler post, here are the 3 washcloth patterns! Washcloths and dishcloths are one of the most used and useful items in our homes. And they’re usually pretty, well, blah. Here you’ll find 3 very different patterns all using one crochet stitch – single crochet! The variations used with the single crochet stitches, make the washcloths look like they came from the most experienced of crocheters! Gauge is not important for this project. 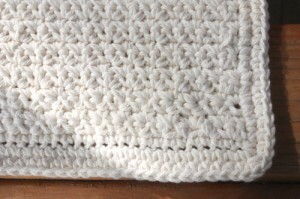 If you’d like a larger or smaller cloth, increase or decrease number of stitches in beginning chain (see instructions). Repeat row 2, 23 more times or until the washcloth is as long as desired. Do not finish off, continue with border instructions at end of pattern. NOTE: In the next rows, you will be crocheting IN BETWEEN the sets of 2 sc you made in the previous row. NOTE: This pattern is worked as follows: 1 sc in the back loop then 1 sc in the front loop, throughout the pattern. You may find yourself moving your piece forward and back in order to see the front or back of the stitch. Single crochet evenly around the washcloth. 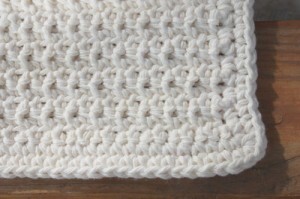 For a photo tutorial on crocheting along the edge, check out our post Crocheting Around the Edges! Remember, you will single crochet along each side of the washcloth. When you come to the corners, 3 sc in each corner. When you have crocheted all around and come to the first corner made, slip stitch into the first stitch of that corner and finish off. This entry was posted on Tuesday, October 23rd, 2012 at 10:51 AM by Corinne Munger	and is filed under Free Crochet Patterns. You can follow any responses to this entry through the RSS 2.0 feed. You can skip to the end and leave a response. Pinging is currently not allowed. Thank you so much for taking the time to print the patterns for all of us..How nice of you to do….I am gonna make some with Christmas yarn..They are so pretty..Nice work!!! Thank you! I hope you enjoy making them. Once you get the hang of it, you’ll fly through them! Just tried dishcloth no.3,I love it! It is so pretty and the texture is awesome. I added my own border. Great Pattern! Thanks so much for taking the time to post and share the patterns.. I appreciate it so much! I bought some red and green Christmas cotton to get started! Blessings! I’m sure they’ll be really pretty in Christmas colors! Have fun! Thanks so much for your promptness in sharing the patterns. Hobby Lobby here I come, these have made my Christmas “to-do” list for sure! Thank you for printing the lace angel it is very pretty. I will make several of them. Hi…thank you SO much for your generosity in publishing these patterns. I am somewhat new to crocheting and am wondering what is the difference between skipping a chain (skip 1 ch) and skipping a stitch (skip 1 st)? Thank you! Hi Lori, You’re welcome! The difference between skipping a chain vs. skipping a stitch is simple. When it says skip a ch, that’s because it’s the first row you’re crocheting (into the foundation “chain”). Skipping a “stitch” is when you’re crocheting into additional rows that already have crochet stitches in them. Does that explain it? thanks so much for posting the patterns so soon!!!! Like I said before, I am new to crocheting so I apologize for the multiple questions for explanations—in Washcloth #2 it says: “NOTE: In the next rows, you will be crocheting IN BETWEEN the sets of 2 sc you made in the previous row.”—does this mean I literally reach down to the previous row to work the stitches? Thank you…I appreciate your help. That’s ok Lori. that was a little tricky to put into words. Let me try another way……when you crocheted the previous row you crocheted, sc, sc into the same stitch and then moved to the next stitch and crocheted sc and sc. You want to insert your hook BETWEEN the two “sets” of sc. It’s a little tricky to see but if you put your finger behind those sets of stitches and push it out to wear you stretch it, you’ll see a little easier where to make the next stitch. Normally, you insert your hook underneath the 2 loops of the stitch, but in this pattern, you don’t – I’ll try to post an additional picture of this (not sure if I can get a picture to depict it, but I’l try). I think I know what you mean! Thanks, Corinne! Thank you for posting these! I am going to start one tonight! Thanks for these patterns. So far, I like #3 the best. It makes for such an interesting texture! These are very pretty. Thank you very much for sharing. I look forward to making many. Hi Cathy! Glad you like them. Let us know if you have any questions. Happy crocheting! Can’t thank you enough for these patterns…….will be starting shortly as I think that they will make wonderful christmas presents…. I love moss stitch (sc, ch, sc) in washcloths! Looks woven. Beautiful patterns! Thanks! Thank you soooo much for posting the directions to your cute dish cloths. I can’t wait to get started. Love these! However, I’m having trouble with pattern 3. The ends of my rows are becoming uneven as I crochet up – like I’m dropping a stitch with each row. Should my last sc in each row be in the turning chain? This pattern is a little tricky as you work in the front loop, then in the back loop – your row kind of gets “twisted”. Make sure to count your stitches (30 in this case), and every row should end up with you making a stitch in the FRONT loop (not the turning chain). I’ve struggled with both pattern 1 and now pattern 2. I’m not sure what you mean when you say skip the first stitch. Do you mean the stitch that’s under the turning chain? If I skip it, then when I skip the next stitch, I’m one stitch ahead of being in between the set of two. Hi Sasha, Let’s see if I can explain it a little better for you. When the instructions say, skip 1 stitch, it’s talking about the very 1st stitch in the row before the one you’re working on. In pattern 1, you will be working BETWEEN the single crochets in the previous row. In pattern 2, you will be making 2 single crochets in the same stitch, then skipping a stitch and then making 2 single crochets again in the next stitch. When you being a row, the first stitch in the row is the first stitch AFTER any turning chains you made. In pattern 1, you will always be crocheting a single crochet in the chain SPACE for your 1st stitch. In pattern 2, when you turn your row, you will have 1 sc, a space, and then 2 sc in one st. You will crochet in the 1st space after the 1 sc, then skip the 2 sc and then crochet in the space after that stitch. I know it’s confusing but I hope this helps you a little. Thanks, Corinne. I think that will help. My rows keep getting smaller and I’ve restarted several times and I can’t figure it out!!! Can you help me? Sure! My biggest tip would be to try and count your stitches after you do each row. You may be accidentally skipping stitches. Hi, thank you for the patterns. I was thinking of starting to sell dishcloths, and was wondering about these patterns. Are they yours, and is that a possibility, or would I only be allowed to give them as gifts. Hello, Corrine. I plan on making a set of all three of your washcloths and had started with Washcloth #1 when I ran into a problem on the very first row. The pattern states to chain 32 (or any even number of chains) and then work a sc in the third chain from the hook; however, whenever I ch 1, skip 1 ch, sc in next ch across, I end up with one chain left over at the end of Row 1. I’ve started over several times and still end up with an extra chain. I know I’m not forgetting to skip a chain in between the single crochets and have counted my single crochets and chains. Could you help me, please? Your assistance would be greatly appreciated. Hi Venetia, I think Corinne meant to say “forth chain from hook” instead of “third chain”. I just updated the pattern. Let me know if you run into anything else. Thank you for responding to my inquiry. Your response is appreciated. I will be sure to alter my copy of the pattern to start in the fourth chain from the hook. I attempted washcloths #2 and #3 while waiting for an answer and ran into the same problem. Guess I’ll try skipping one more chain with them, too. Again, your response is truly appreciated. Hi again! Washcloth 2 and 3 seem to be correct for the beginning chain as far as I can see. For washcloth 2 you’ll start with an even chain. For washcloth 3 you’ll start with an odd chain, which will give you and even number of single crochets on the first row. I’ll give them all another try . . . they are too beautiful not to. I may have been thrown off when I started the first washcloth and had trouble with it. . . .
Here’s wishing you a T-riffic Tuesday. Hi Lizzie, I haven’t had much experience with items shrinking that much! Some shrinkage can be expected, but I’ve never heard of something shrinking by half unless it was a natural fiber material (such as wool) that felted in the washing machine. Hopefully others will be able to help! I use Bernat Handicrafter cottons a lot for bags, and I make a lot of washcloths for gift bags also using the same. Although there may be minimal shrinkage, I haven’t found it necessary to ‘up’ the size to accomodate. I wouldn’t hesitate to use if for the items you mentioned. Hope this helps. It seems to me interesting but there is numerious steps this is a project I would get very frustrate due to the various steps to fall to make this item it would keep you moving not boring to do this is very hard to do . Thanks so much for the patterns 🙂 I just made a headband using #1 pattern. So cute. Love making headbands with cute new stitches I find. In pattern 3, is the single crotchet in the back loop the same stitch as the sc in the front loop or is it the back loop of the next sc? Btw beautiful patterns. You will work into the next stitch, not the same stitch. Thank you for your lovely patterns and clear instructions. I’m a novice crocheter and I need all the help I can get. Your pattern directions make learning so easy. I have a question regarding the copyright on your patterns. I will be teaching beginner classes and would like to use some of your free patterns. Is that permissible as long as I include your website/pattern name/etc. so you receive proper credit? Do I need to request permission for each pattern I want to use? Or is using your patterns for teaching purposes not permissible at all? When you print the pattern out be sure that the url for credit is on each page. You can print directly from the website since each pattern is coded to be printer friendly. How much shrinkage happens with the cotton yarn? I don’t really notice it that much. Plus it may vary with brand, even if they are both cotton. 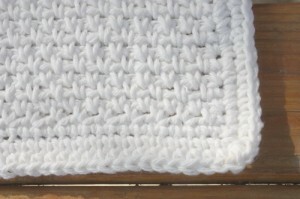 If you’d like to get a good idea for your yarn you can crochet a small swatch, say 4″ square, then wash it and remeasure. Hi & thanks for the patterns. I finished #3 & nearly done with #1. I’m enjoying doing these & loving how they look. I’m going to beg a little for some help with #2 before I drive myself mad. I have tried a dozen or more times but I just don’t get it, I get the 1 st row done fine but then I’m lost, the instructions seem clear enough but somehow it’s not working for me. I’ve tried to ignore it but my stubbornness won’t let me. I’ve read the comments where you’ve tried to explain #2 better, but that hasn’t helped either. If you can’t post a video or pics of the 1st 3 or so rows, wondering if you could tell me at least how many stitches I should have at end of rows? Thanks again for the patterns. i just finished #1 and it looks and worked great. I have tried both #1 and #2 and can’t seem to get them to work, in #2 if I crochet in the second chain from the hook I don’t end up with an extra chain on the end, it’s an even amount, and same with #3, I end up with an odd number still. Am I supposed to skip more or less? I’m just a bit confused because the first one worked great so I believe I’m putting it into the chain you are saying. The “2 sc in second ch from hook” will use 2 chains. Each time you do the repeat “2 sc in next ch, skip 1 ch” it uses 2 chains. The “skip 1” at the beginning and the “sc in last ch” will use 1 chain each, for a total of 1+1= 2 chains. Since everything uses a set of 2 chains then the starting chain must be an even number for the row to work out correctly. You’ll start off with an odd number of chains. The “sc in second ch from hook” will use 2 chains, so you should still have an odd number of chains left. Since the remaining number of chains is an odd number, and you are going to sc in each of the remaining chains across, you’ll have an odd number of sc, plus the 1 sc made from the “sc in second ch from hook”. Any odd number plus 1 will be an even number. So you should have a even number of single crochets when you are done row 1. Try double checking your stitch count while you are crocheting. It is really easy to accidentally skip a stitch when you are crocheting. One missed stitch can through everything off! Question, Can these be used for a wash cloth, like for bath or face? I see a lot of comments about these being dish cloths? Please clarify. Thanks! Yes! They are multipurpose. They can be used for bathing or for cleaning in the kitchen. I saved your instructions for the wash cloths.I have been crouching pot holders and I wanted to do more.I made my first dish cloth I don’t know if it turned out the right size because I crochet tight. The first big thing I have made was a Bed Spread my Sister had made one and I got some yarn and made a square and when I got back home from Tennessee Ibought yarn and made me one.The spread had pop corn stitches in it.I have a picture on my Facebook post Quiet a few people say it is a Heirloom I made it with Red Heart Soft White. These are the perfect washcloths I’ve been looking for!!! I am confused on the edging – I sc all around 4 sides as indicated in instructions and come back to the beginning of my edging. Do I add the 3 sc here again and if so, to end my work do I slip stitch in this new middle stitch of the 3sc? Or am I supposed to go around my 1st edge again and come to my first corner and slip stitch in the middle sc on this corner? Hi Karen, you don’t have to make 3 into the corner again if you already did that corner. When you do your last side, you will end up at the very first corner you made when you are done. You will make a slip stitch into the middle stitch of the first corner. The directions don’t indicate to do 3 sc as soon as you turn your work. Are you saying that I should be making 3 sc right away and then proceed to sc across the top row? Yes, you will make 3 single crochets into your first corner when you start your border. If you didn’t do that, that is okay too! You can go ahead and finish that first corner when you get to the end. Make the 3 single crochets into the corner at the end then just slip stitch into the first single crochet you made on the border to finish off. Repeat step 2 for this side. When you reach the corner, add 2 single crochet stitches to the 1st single crochet made in your edging (so that there are 3 total) and slip stitch. I just did a sample and I had to “slip stitch” into the 1st stitch of edging (this is after adding the 2sc into the final corner). This means that your cannot slip stitch into the middle stitch because the middle stitch is the last stitch you crocheted on the side of which it is impossible to slip stitch into. 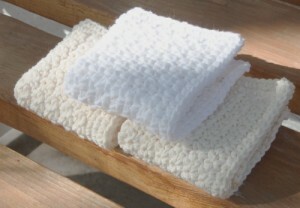 Anyway, I love all 3 washcloths-all look great and are very easy to make. Hi Annette! Yes, the pattern will work and will have a looser look if you use a bigger hook. You can experiment with different hook sizes, and even different yarn thicknesses to see what you like! Stephanie Needham at least your school still offers Home Ec. Around here most, if not all, of the sewing classes are gone. I’ve made a couple of these washcloths and they were a bit difficult for me to crochet but they were doable. I am a novice crocheter. I like to count my stitches to make sure by row, I am not adding or dropping stitches. I noticed for Washcloth #3 you mentioned it should be 30 per row. What about for #1 and #2. Thank you for the free patterns. I was at a friends house last night and she had some she had bought from a craft show, and she said she loved them, but she’s used them so much 2 of them had holes in them. I told her I would make her some, and so I came across your patterns. My question is, I am using the Peaches and Cream Cotton yarn, and it is very stiff. Does it soften up after washing, and how big are the washcloths after they have been washed and shrunk – I am using the sizes in your patterns. Been looking at lots of websites for facecloths I could give along with the baby items I have made my pregnant friend, but I was not pleased with them. I got your email of three patterns and I am so excited to make them. Finished the first one and it was so simple to make but looks beautiful. Thank you for giving us these patterns. washcloth and face cloth for my powder room. These are lovely! I started making a swatch of the moss stitch & realized it was your 1st washcloth so I added a fat sc border & love it. What are the names of the other 2 stitch patterns? The 2nd seems similar to the mesh stitch but a little different. Thanks for the great patterns! I figured out that the 2nd washcloth stitch is called the alternate single crochet and the 3rd I think is just called front & back loop single crochet. I find it helps to know the names so I can watch videos of them to learn them easily. Also, if you add a border in the same color yarn as the body I find it’s best not to turn the work as then you are adding the border to the backside of the main body’s stitch pattern. Our group crochets and knits for charity. I made cloth #1 using a colorful multi color cotton. It went “viral” with the ladies in the group. Many requests for the pattern. Thanks for sharing . Pattern #2 I have tried numerous times but do not end up with the needed extra chain at end of row one as another poster pointed out. She was given the directions below which don’t work for me. Rachel said, ” The “2 sc in second ch from hook” will use 2 chains. Each time you do the repeat “2 sc in next ch, skip 1 ch” it uses 2 chains. The “skip 1” at the beginning and the “sc in last ch” will use 1 chain each, for a total of 1+1= 2 chains. Since everything uses a set of 2 chains then the starting chain must be an even number for the row to work out correctly. In your instructions, you say skip one at beginning and the sc in last chain = 2 chains, that is true for rows 2 and up. But row 1 starts with sc in 2nd chain = 2 chains, then skip 1 ch, sc in next wil use up the remaining even number 30 chains so there is not an extra chain at the end of row one. To simply illustrate, if I started with 6 chains, sc in 2nd ch from hook = 2 ch , skip chain 3, sc in ch 4, skip ch 5, sc in ch 6. There is not an extra stitch remaining to do a sc per instructions. This has been frustrating to start over so many times and would be for others so any feed back would be appreciated. Thank you. The repeat ends with the skip 1 ch, not a sc. So in your example the sc in your 6th ch is your last sc into the last ch. Thank you so much Rachel! I was complicating something that was so simple, lol. Row 1 is all good but now row 2 does not end right. I am doing 2 sc’s in stitch between two sets of 2 sc’s, NOT between the 2 sc stitches in the same stitch, correct? If so, the row ends differnt than row 1, After I do the last 2 sc’s in the same stich, I end up with one stitch left, so the 2 sc’s and the last sc will be in the last two stitches, but gather from the directions, there should be a stitch between the last 2 sc’s and the last sc. Again, your help is greatly appreciated! Isn’t the “humble” SC a great stitch? So versatile, and so different depending on where you place the hook! Now you have me wanting to do a “Study on the Single Crochet”, and whip up a batch of cloths that use nothing but the variants of this very first stitch that a beginning crocheter learns. As we get better at this hobby/art/craft, it’s so easy to fall into the trap of thinking that in order to make a ‘really impressive piece’, it has to have elaborate and complicated stitches. Not true at all! Sometimes, it’s good to just go back to basics and play with the simple stitches that we learned as novices… or if you are a novice, to learn from the start that beautiful crochet work doesn’t have to be hard! I can’t tell you how many ‘Oohs and Ahhs’ I’ve heard when I wear my winter scarves that are made up of just the simplest stitches! This is so great… thanks for sharing! Now I’m off to make a housewarming gift for a friend… a stack of washcloths, a couple of potholders, and a pair of larger dish towels or as I call them– biscuit blankets (used to cover a basket of hot fresh biscuits, rolls or tortillas and keep them nice and warm)… or maybe some place mats!